Drax supplies around 7 per cent of the UK’s electricity, with four of its six units converted to burn the pellets. Britain is committed to closing all its coal power stations by 2025 unless they can be adapted to ‘capture’ carbon without releasing it into the air. A Drax spokesman defended the technology, stressing it is ‘critical to the UK electricity system because it provides low-carbon, cost-effective power reliably, whatever the weather’ – unlike wind and solar energy sources. But Sasha Stashwick of the Natural Resources Defence Council, an environmental campaign group, said: ‘Burning trees in giant power plants is bad for the climate and the air Britons breathe. ‘It’s important that [the clean air strategy] recognises the drawbacks of biomass energy … and rings the death knell on new rounds of subsidies for this dirty power source. ‘Sadly, it does nothing to stop billions of pounds going to existing coal-to-biomass conversions. Some of us have, of course, been arguing these points for a long time. It is not clear, however, how Michael Gove can put an end to CfD subsidies, as they are legally enforceable contracts which last for 15 years. Government cannot simply renege on them. So we could soon be in a position where me burning logs or coal at home is illegal, yet the government will have pay Drax £1,000,000,000 a year to burn wood pellets. Paul, in the name of “saving the planet from CO2” they can cancel anything, regardless of how “legally binding” they are. It will be a case of “so sue us”. While wood burning was always technically stupid, it does allow Drax to keep operating and provide some grid security and a little storage of energy, albeit nowhere near as much storage as coal-firing because of the difficulties of storing wood. Sensibly, it would return to burning coal, but sense is not a feature of UK “green” policies: however, if the AGW nonsense is eventually recognised by the controllers, it will still be possible. Just because it’s devastating US and Canadian forests shouldn’t get in the way of a stupid idea. This is just another example of how incompetent the establishment is. This is just another example of how brainwashed by the greenies, the establishment has been. They probably can’t, or won’t, renege on their CFDs. However, they could impose new emissions taxes at any time for the generation. All this came about because of the crazy EU stance (rubber-stamped, of course, by successive pathetic UK governments) to account for the whole process’s “carbon emissions” at zero, due to the beyond-dubious “sustainable” declarations made by the process owners and operators. By “process”, I mean the whole incredibly energy-intensive game from cutting down forests in the US through to burning the pellets in northern England. Humankind burned huge numbers of trees before coal was used. Returning to burning wood is as stupid a concept as returning to the 12th Century practice of using windmills for power. As I said above, windmills is yet another example of how incompetent the establishment is. From the point of view of CO2, burning wood is better than coal as “renewable” in that it takes only a few years to replace the trees (which captures the CO2 again), rather than millions of years for coal. However that would only apply if the trees are grown specifically for burning and not ancient forest, It is debateable whether sufficient trees could be grown to make it sustainable. Not true. If you burn a 100 year old tree then logically it will take 100 years for a new tree to reach the same size and contain the same amount of carbon. Add on the fact that a mature tree is still growing and since it is bigger than a newly planted sapling will absorb more carbon and burning wood becomes a source of carbon dioxide emissions in the short to medium term. If the IPCC are correct and we have 12 years to save the planet (complete rubbish but lets pretend for a minute that it’s true) then leaving mature trees to absorb more carbon than saplings has to be the best idea. Plus you have to consider the impact on biodiversity of logging old growth forests. The only way to grow anywhere enough trees would be to have vast mono cultures of fast growing non native species which would be a disaster for biodiversity. 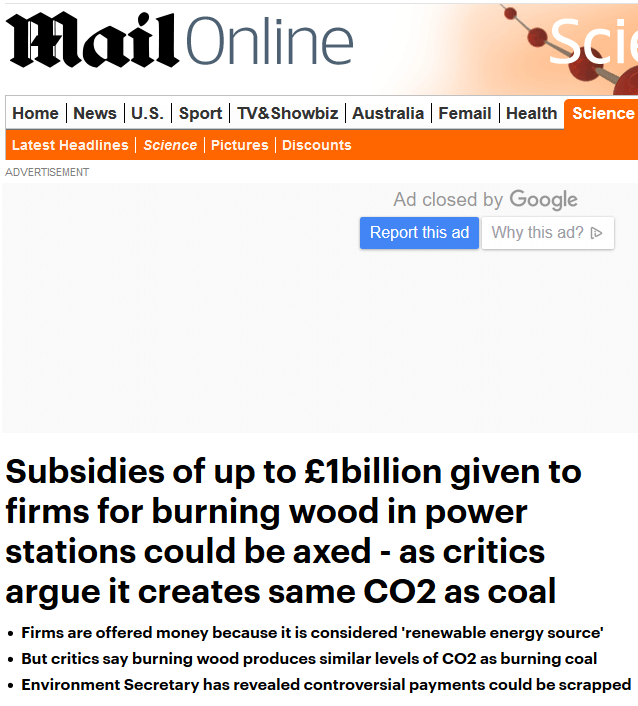 Obviously burning wood can be claimed to be carbon neutral if the carbon emissions are ignored as is the case with EU rules, but just saying something is true does’nt make it so. This is just one more example of how EU environmental regulations often do more harm than good. Hopefully Brexit will mean we can scrap them all and maybe have a bit of common sense, although we will also need to scrap the climate change act. If you read my post, you will find that is almost exactly what I said, in fewer words. not to mention the cost of destroying forests-which I don’t see as a renewable resource as taking 25 years or so to regrow-plus pelletting and shipping -as much CO2 as coal! Another nonsensical and costly response to the climate change lobby. In the same vein as growing bio-fuel as opposed to food, what could possibly go wrong? Fiddlers Ferry Power Station burns part coal, part wood and the owners want to shut it down. They were given contracts till March, partly because the grid realised it was a black start station and had to provide a replacement before they gave permission to scrap it. I expect that to be shut down since the EU made the payments to keep it open illegal. And yet think on this all you green Berks, that, mankind has relied on dirty nasty wood burning …..oooh erm well since erm since he swung down from the trees – mark and learn. You see the quid pro quo – yeah true fires produce lots of smoke and stuff but hey – you know it keeps yers warmy, warmy and it helps you cook stuff. Now there’s the thing, eatin’ raw vege and berries is where some people are at and good luck with that but me, meat is the best way to sustain the body and cooking (yes vegetables too!) it is the best way for the human system to be able to digest said grub. Lordy! it’s a simple equation easily understood by our supposedly inferior ancesters: fire preserves and sustains. Are you listening, you dullards and – mr Gove? Now, call me a doubter and certainly I am, I doubt that between in the establishment, UK administration and political claque an ounce of common sense could be mined. Mmm and seeing as they’ve given themselves over to the high priestesses of the green moonbeam technology regression. Now, they want to ban erm burning stuff and you know – fire! Perhaps just forever forgetting that Fire is what made us what we are, civilized and as we see the greens are anything but civilized – as are all fanatics on the Nth degree will do and inevitably, guaranteed: death follows. Its a numbers game, more of us stay fit hale and well when we’ve access to warmth ie chep and plentifully available gas/lecky/coal indeed the quid pro quo, for a bit of pollution (most of which can be scubbed) is that we all stay warm – how about supping some food for thought and digesting THAT mr Gove and mz Perry? When they say ‘put an end to subsidies’ that must mean any new subsidies after the decision is passed in Parliament. The law of contract still applies in Britain! Government cannot regnade on them? Why ever not they do on most other things they have introduced that don’t work. Anyone know where to look for the data on the carbon dioxide generated by the various stages of harvesting, compacting and delivery of pellets to Drax? Somebody must have done that homework even if it has been “lost”. Like windfarm creation such front end energy costs have seldom engaged the renewables lobby. Isn’t burning coal much cleaner than burning wood i.e less some and ash. Oops I meant less soot and ash.